The Fundació Foto Colectania was the meeting place this morning for the jury of the first FCBarcelona Photo Awards, before their deliberations of the winners in the two categories; the Photo Awards, for the picture that best reflects the positive values of sport, and the Project Awards, for the project considered to best express the contribution by sport to modern society. Sponsored by Agbar and in partnership with the Fundació Foto Colectania, these awards are designed to identify photography that best and most deliberately reflects the intrinsically positive values of sport and were especially created to reflect these values through the lens of contemporary photographers. FC Barcelona president Josep Maria Bartomeu, joined by Carles Vilarrubí, vice-president of FC Barcelona and head of the International and Institutional Relations Area, Mario Rotllant, president of Fundació Foto Colectania, and Àngel Simón, executive president of AGBAR, greeted the special guests whose job it is decide on the winning entries. The jury features such prestigious names as Vicente Todolí, ex-director of the Tate Modern London, Ayperi Karabuda Ecer, ex-vice-president of photography at Reuters, Azu Nwagbogu, founder and director of the African Artists’ Foundation (AFF), Sandra Phillips, former senior curator at the MOMA in San Francisco, Christopher Anderson, member of Magnum Photos and Stephen Mayes, who has managed projects and artists in different sectors for more than 25 years. The formalities over, the six members of the jury than sat down to assess the entries. Notary Gerardo Conesa was there to take minutes and then the juries for each of the categories divided up to discuss their views. The winners in each of the categories will be announced over the next few days. 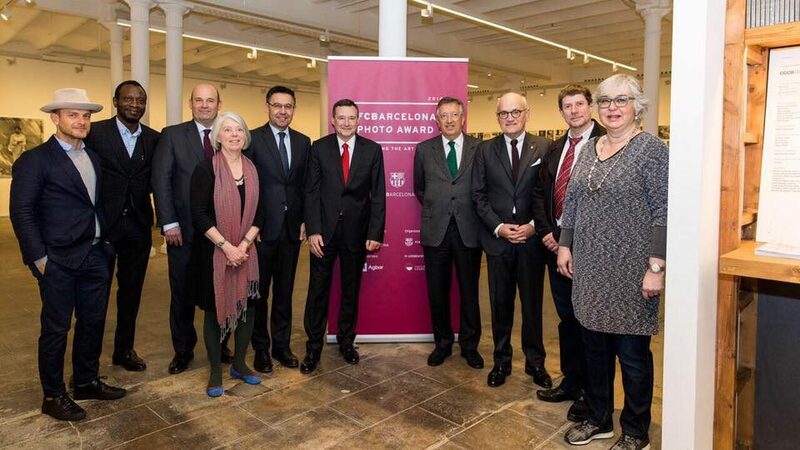 The award ceremony is scheduled for late June to coincide with the opening of an exhibition that FC Barcelona will be organising to display the winning entries, along with those of the 29 finalists in the Photo Award category. A catalogue containing all the winners and finalists is also going to be published. The club will be making every effort to promote the winners globally, with a number of promotional events having been planned for different cities in Europa, the USA and Asia. This modality is aimed at photographers with an accredited career in the media, photography agencies or in the art world, and reward the photograph that best expresses the positive values of sport, with a particular focus on non-professional sport. A first prize of €40,000 will be awarded and there shall also be 29 finalists that will receive €1,000. The winning photo, as well as the finalists, will form part of an exhibition to be organised by FC Barcelona from April to June 2017. – Vicente Todolí, ex-director of Tate Modern London. Artistic director of Hangar Bicocca in Milan. – Azu Nwagbogu, founder and director of African Artists’ Foundation (AFF). – Sandra Phillips, former senior curator of MOMA, San Francisco. This modality is addressed at photographers with an accredited career in the media, photography agencies or in the art world, as well as those that have experience in project development. The winner will receive €40,000 to be used to make a reality out of the photography project that best expresses the intrinsic values of sport and its contribution to modern society. The winning project will be undertaken from March to October 2017 and shall be displayed along with the winning photographs in the PHOTO AWARDS modality in the 2017 edition. – Ayperi Karabuda Ecer, former vice-president for photography at Reuters. – Christopher Anderson, member of Magnum Photos. Winner of Robert Capa Hold Medal. – Stephen Mayes, more than 25 years of experience managing projects and artists in different sectors.